To mark the rising of the Eldritch Moon and the death of Innistrad, I thought it would be a good idea to take a look at some of the big gribbly monsters that our heroes in the Gatewatch have been fighting for the last year. To make it onto the list, there were three rules: 1) Be big, 5 mana or more. 2) Be colourless, none of this halfhearted devoid, and 3) Be cool. Known for being part of the brutal Eldrazi decks that dominated Modern before the Eye of Ugin bans, the Reality Smasher would come down early and start smashing faces as well as reality. This monster was brought to us by Kozilek, the titan of Distortion, and that comes through in the art, the hell is going on with that leg nearest us? Is it coming out of the ground, or falling from the creature? Reality Smasher is a functional beatstick of a card, but doesn’t have the same weirdness as some of the other Eldrazi. Oh my God, I can’t even right now. Void Winnower stops cards with even mana costs doing anything, and it reinforces the oddness of the Eldrazi. You would never see a human, or even a horror with this sort of rules text, it’s just so… alien. Sadly, the art has no sense of scale or epicness such a massive statline and weird effect demand, but we can’t have everything. It’s the dude on the left. The right is just a giant worm. A commander and casual staple, Artisan is two creatures for the price of one. As with most of the big Eldrazi, the trigger is on cast rather than on entering to make sure that something comes of that 9 mana investment. And if it does resolve, then Annihilator 2 means that the suffering starts before that 10 damage hit. There’s not much flavour here, it’s just a big dude that brings another big dude with it. The 10 mana 7/11 isn’t outstanding, and Annihilator 1 is scary, but not horrible. 4 mana to get a pair of chumps, getting 2 of that mana back is okay but still puts you behind 2 mana. And then we come to the actual reason you play this. 20: Play any and all Eldrazi you own, for free. In competitive, that’s nothing amazing, but it still says you win. In casual though, where you can play any number of Kozileks or whatever else you want, it’s probably the most insane effect of any Eldrazi- and it says cast them, so you even get their triggers! Cast 20 Emrakuls, get 20 extra turns to deliver the beatings with. If your opponent survives that, they deserve to win. Weirdly, it never betrays you. Surprisingly loyal in fact. 12 mana 11/11. Check. Annihilator 2. Check. Terrifying effect that wins the game if unanswered? Very check. There’s “killing everything”, and then there’s “killing everything and bringing it back in a state of unending torment unable to comprehend its own suffering”. It That Betrays makes your opponent suffer, makes their creatures suffer and then makes your opponent suffer again when those creatures come back and hit them. Meld is a very cool mechanic that represents the warping power of Emrakul. By combining two creatures into one, you creature a horror greater than the sum of its parts. In this case, you combine Hanweir Garrison and Hanweir Battlements (both strong cards) to create a town that walks and sends out its own inhabitants to attack as well. In the story, Hanweir responded to Avacyn’s madness by building a giant wall. Because that will stop the flying angels. Anyway, this wall seems to have been the doom of Hanweir as no one could escape the influence of Emrakul slowly fusing them with the town they fought to defend. The Infinite Gyre would be a sweet name for a rock band. Ulamog is the blandest of the Eldrazi Titans, existing solely to feed on the mana and life of a plane. Each of His spawn is as blank and faceless as Him, specialised into forms that convert energy into other effects to help with even more consuming. He was almost defeated by an Aligned Hedron Network in Battle For Zendikar, but Ob Nixilis redirected the power to himself to reignite his spark and call Kozilek to the surface. They would never let go, never. They had seen the light, felt the power. The truth had embraced them. It had made them. Instead, they had become. Her. One. One’mrakul. If you’re wondering, the best meat on Truth is the shoulder. It’s remarkably lean. Kozilek and His brood warp perception and space. Where a normal being would have a head, there is just pitch black and utterly featureless set of plates, looking like holes in space. He has similar growths on His forearms which can be used as weapons. While physically powerful, Kozilek’s true strength is his Distortion abilities. Seen in action when He rose at Sea Gate, He de-aged one warrior to the point of non-existance, turned another inside out in a second, and scariest of all, he inflicted an illusion on General Tazri where she became His servant and lead His armies against the Gatewatch. In this illusion, He left, leaving Tazri alone in the ruins of Zendikar for thousands, millions of years and she slowly went insane trying to bring Him back. Kozilek was defeated along with Ulamog when Nissa bound them in leylines and Chandra set those Leylines on fire. Who else could be number 1 but Emrakul? She is the pinnacle of Eldrazi terror, and greatest of that horrific species. When Emrakul arrives on a plane, She changes everything. Everything that lives is Her domain, to be changed into Her spawn. Sealed by Ugin, Sorin and Nahiri thousands of years ago, She left Zendikar at some point, and now She has been called to Innistrad by Nahiri’s Cryptoliths and need for revenge on Sorin. She also appears to have some kind of effect on time, as both of her cards cause players to take extra turns, but this is just speculation. 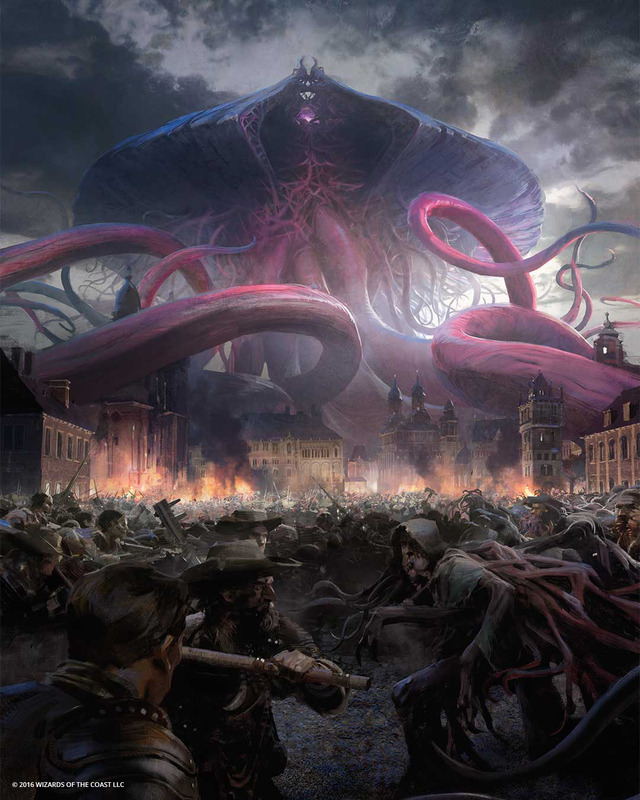 Emrakul is a force of nature, an iconic creature of recent magic and one of the biggest current threats to the multiverse.